Want to be notified of new releases in CSE512-15S/fp-tdurham-ajh24-chiasson-ningli30? Access our visualization [here] (http://cse512-15s.github.io/fp-tdurham-ajh24-chiasson-ningli30/) or download this repository and run python -m SimpleHTTPServer 2255 and access this from http://localhost:2255/. We recommend using either Chrome or Opera for ideal viewing. Caenorhabditis elegans (C. elegans) is small roundworm used widely as a model organism in genetics and genomics. Its development has been well studied; each worm takes around 14 hours to grow from a single fertilized cell to a hatched larvae with 558 cells. This process of embryonic development progresses in a stereotyped pattern that follows an invariant cell lineage; the same branches in this tree always produce the same tissues in the hatched worm. Embryonic development proceeds due to the tightly choreographed expression of several genes. These patterns of gene expression contribute to cell identity. Location of cells during embryogenesis is also important, as cell-cell interactions can influence gene regulation. The Expression Patterns In C. elegans (EPIC – http://epic2.gs.washington.edu/Epic2) project has generated a dataset that describes the spatial orientation of every cell during C. elegans embryogenesis, its developmental lineage and cell fate, and expression measurements for a set of about 227 genes. These data provide an expansive view of gene expression in the C. elegans embryo; however, to derive insights into gene expression patterns in different cells across time we need a tool to integrate and allow interactive exploration of the data. 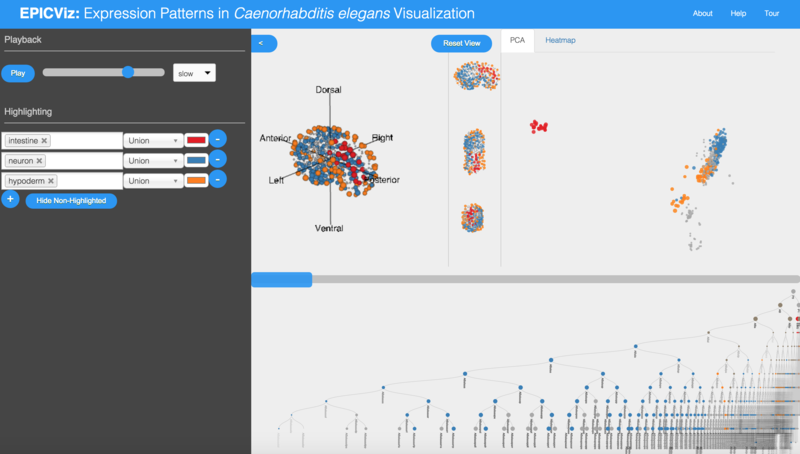 We sought to address this lack of resource by developing an interactive visualization that includes a 3D plot of the C. elegans developing embryo, a lineage tree that is synched to the 3D plot, and plots of gene expression patterns. Users can explore the data using filters for lineage, cell type, and time point. Based on user selection, specific lineages and cell types can be highlighted in color. The user can track development in 3D and in 2D small multiple projections. Genes of interest can be selected from the heat map for further study. For the development process, we discussed the initial data set and storyboard idea together, then reconvened later to discuss the next set of goals once we had the basics of the original storyboard programmed. Significant time was spent discussing how the gene expression data should be displayed, formatting the gene expression data, and implementing the gene expression data in our visualization. Tim worked on the gene expression data formating, along with the gene expression gene report. Andrew worked on the PCA plot and small multiples. Ning worked on adding the intro.js tour of the visualization and highlighting logic. Melissa worked on the html modal dialogs, refining playback, and the poster and paper.